Where can you stream Teenage Mutant Ninja Turtles? On 1987-09-10 Action & Adventure/Animation TV Series Teenage Mutant Ninja Turtles first aired on CBS. Written and created by Fred Wolf & Kevin Eastman, and produced by I.D.D.H. 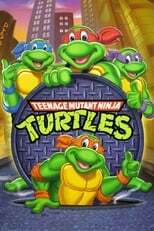 & Murakami Wolf Swenson, Teenage Mutant Ninja Turtles has ended and last broadcasted on 1996-11-02.